The Buda Castle and its complex of historical buildings make up the Castle District, which has been a UNESCO World Heritage site since 1987. It mainly consists of the Royal Palace, Szent György tér, the Fisherman’s Bastion, Matthias Church and the historical residential quarter. This iconic tourist attraction attracts millions of tourists to Budapest every year. The building complex on the Buda bank of the Danube is a symbol of both Budapest and Hungary. 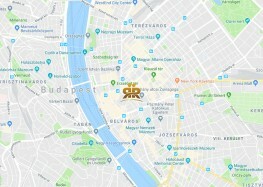 It’s a must-see for anyone who visits Budapest and gives an insight into the country’s former greatness, its beautiful architecture and its historical identity. The Castle, which was home to Hungarian kings from the 13th century, was rebuilt into its present form in the 19th century. The Castle includes the Fisherman’s Bastion, which was previously a defensive parapet, but is now an enchanting walkway for tourists that offers a stunning view of the city. Just a few steps from the Fisherman’s Bastion, you will find the delightful Matthias Church, where Hungarians kings were crowned and which boasts a fascinating interior. The Castle is currently home to the Hungarian National Gallery, the Széchényi National Library and the Budapest Museum of History. The Castle district plays host to popular events all year round, which attract tourists and locals alike. These include the Wine Festival, the Pálinka Festival and other culinary and cultural festivals. Going to the Castle District is like travelling back in time as it offers cultural, historical, aesthetic and culinary pleasures. If you visit, excellent restaurants, cafés and old-fashioned pastry shops will welcome you. The Buda Castle is easy to reach from the city centre: after leaving Károly Corner Residences, in just a few minutes you’ll get to the bus stop of the Number 16, which takes you to the Castle. In good weather though, walking across the Chain Bridge to Clark Ádám tér is a delight in itself. From there, you can take the Buda Castle Funicular to the Castle, which is a marvellous ride.